PQube has announced that Gal Gun: Double Peace will be released for the PS Vita and PS4 in North America on July 19, 2016 and Europe on July 15, 2016 both as a physical and digital release. 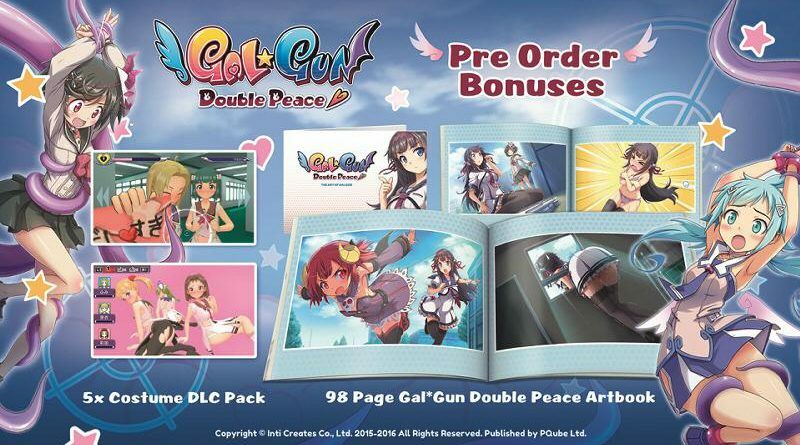 PQube also announced a Gal Gun: Double Peace Limited Edition which will be available on the same dates. Check with your local retailer to find out which one they are offering. Gal Gun: Double Peace is a railgun shooter where a young man who after being shot by a Cupid angel must survive an onslaught of smitten Academy girls hell-bent on declaring their love for him at any cost. Only by wielding a Pheromone Gun, which can deliver a dose of knee-trembling euphoria at the pull of a trigger, can he keep the girls at bay – and find a safe path to his one true love.